When times are tough, it can be hard to see the good in your life. To help me cope with cubes being in the hospital last month, I needed to remind myself daily to think about someone or something I was thankful for. My daily "Grateful for" practice, got me thinking about my forgotten 365 Days of Thanksgiving project (at the moment there are only fifteen photos in my 2013 365 Days of Thanksgiving Flickr gallery) and the November 2013 HaveNotWant Challenge. How do you focus on what's important? Last December, I had this grand idea that for 365 days I'd document who or what I'm grateful for and why and then create a Blurb book. I struggled with the project until last month when life started not going according to plan. Until then a photo a day, every day for 365 days in a row, seemed a tall order. So, for this year's HaveNotWant Challenge, I decided to combine my passion projects. 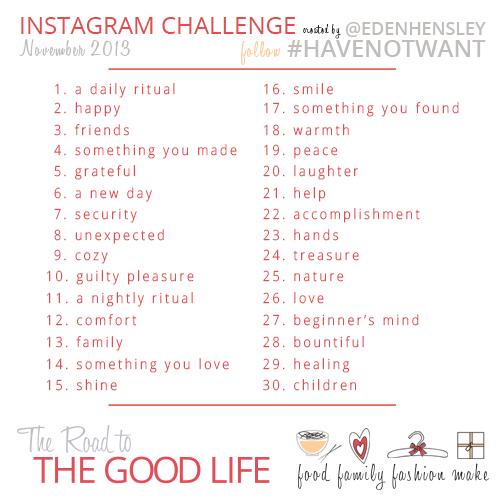 For this year's HaveNotWant Challenge, I want to focus on the little things, those moments or rituals that are part of our routine and that together make a good life. For the month of November, I've put together daily prompts to help us appreciate our everyday lives and the people in those lives a little more. You can participate all month long or just when the prompts resonate, simply tag your photos #HaveNotWant and follow #HaveNotWant to see what others are thankful for. Will you join me on the HaveNotWant Challenge? Because our family has so much to be thankful for this year, I think it's so very important that we take the time to reflect on what we have. To encourage others to participate and to capture these moments -- or others -- in a simple keepsake, I'll be giving away two Instagram photobooks from Blurb (two $25 gift cards). Curious how you can win a Blurb book? Each photo tagged #havenotwant and shared on Instagram throughout the month of November (photos shared after 11:59PM on November 30th 2013 won't be eligible) will be entered into a random drawing. Winners will be chosen using random.org. If two photos from the same person are chosen, I'll draw another random number to find a second winner. I hope you'll join me this November. Feel free to share this challenge with your family and friends if the theme resonates with you.